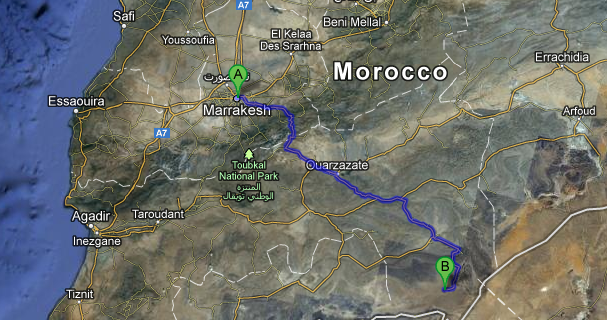 One of the things that I really wanted to do in Morocco was spend a night in the desert. 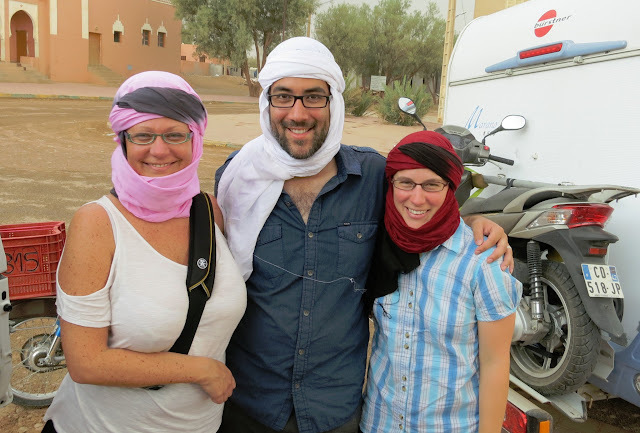 Lucky for us, one of Sabine's friend, Mohamed, owns M'Hamid travel, a travel agency that specializes in desert excursions. She arranged a trip for us that included two nights in the desert and a camel ride! We were lucky enough to bump into Mohamed while we were in Marrakech, and he offered to drive us to Ouarzazate (through the High Atlas mountain range). The scenery during the drive was really nice and we were travelling late in the day so we go to see sunset over the mountain range. In Ouarzazate we stayed at Mohamed's riad Hotel Riad Ouarzazate. It was beautifully decorated, definitely one of the nicest places we stayed on our entire trip. On arrival, they had soup and a chicken, lemon and olive tagine ready for us - it was very tasty (perhaps when we get back to food blogging we'll have to give it a try). The next day, Mohamed arranged for one of his drivers (also named Mohamed) to take us to all the way down to the southeastern corner of Morocco (and the end of the highway), M'Hamid. On the way to M'Hamid we visited the ancient kasbah in Tamnougalt (it's unclear how old it is, it may date back to the 14th or 15th century). I found it pretty interesting to find out that the kasbah had a jewish quarter. Morocco had 250,000 to 350,000 before the founding of Israel, but fewer than 7000 now remain! We drove through the Drâa valley. The Drâa is Morocco's longest river and the valley is filled with palm trees and is very lush, in sharp contrast to the extremely arid areas just beyond the valley. We did a bit of offroading along a dirt road and Laura and I hiked to an old watch tower in the valley. We thought it was pretty interesting but unfortunately we don't know anything about it. As we arrived in M'Hamid, the desert dust started blowing (so much so that it visibility was limited) and it started to rain! Locals told us that this was the first time it had rained in 6 years! The next post is going to include pictures from our first night in the desert, as well as pictures from our camel excursion!